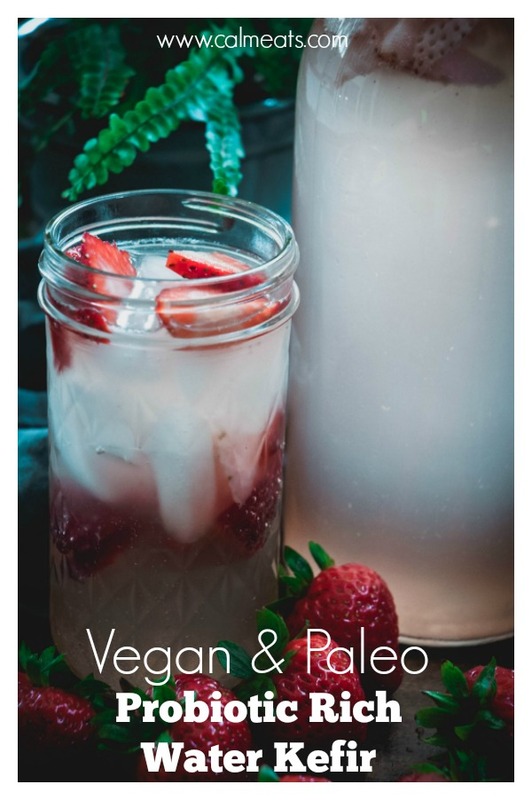 I've been trying to get this very simple water kefir recipe shot and written for over 6 months but kept putting it off. Other recipe ideas crept in and took priority and to be honest, photographing liquids simply hasn't always been my favorite. Sometimes photos do turn out but most often I find them to be a bit of a challenge. Light has to be just right and in the past when I've had a go at shooting this strawberry water kefir, it wasn't quite what I'd hoped, so I tabled the thing several times. So for today I had an entirely different recipe planned. I was thrilled, loved the combination and was sure it would turn out just right. But after several tries realized it was not going to happen. It failed miserably. I was dissapointed and truly frustrated about the waste of time and ingredients but this is part of the process so I reluctantly had to accept it. After dusting the tapioca flour off my shirt, I had to come up with an alternative and fast. Serendipitously, in stepped water kefir. I'd just made a fresh batch and after staring at the bubbly, pink drink for a while, I realized today may just be its day. I couldn't quite believe it, my beloved water kefir was going to save me. So let's talk about this bubbly, delicious strawberry water kefir. If you're a soda drinker and are reading this blog, I'm going to go on a limb and say that maybe you're trying to make some sort of change and improve the health of your gut. Well you're in luck; this probiotic drink is a delicious and healthy alternative to the conventional stuff. But there is a commitment involved. Every 2-3 days, you have to switch the grains from their current water to a fresh batch of sugar water. Your grains will continue to grow and expand and eventually you will have to split and add them to other containers or if you have any takers, give some away. Sound intimidating? It's not. I was sure I was going to mess it up when I first tried it but you'll see just how simple it is. In my opinion, the water kefir gets better after several batches once the grains really get used to the new environment. 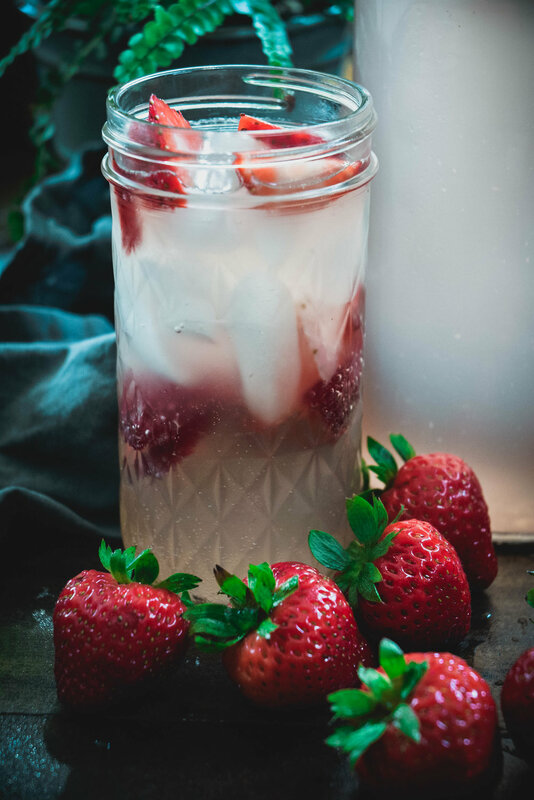 I've made this recipe many times with a variety of fruit and have settled on strawberries as holding up beautifully, fermenting well and though naturally losing their red color, they flavor the water perfectly. Since I can't find grains locally, the next best thing is Amazon. I've ordered from this company several times and can't say enough about their quality and consistency. Combine sugar and water in wide mouth bottle and stir with wooden spoon until sugar dissolves. Add water kefir grains, cover with coffee filter or cloth and secure with rubber band. Store at room temperature for 2-3 days. Once water kefir has finished fermenting, strain liquid in bottle with stopper and reserve grains. Wash wide mouth bottle well and start the process all over again. You can do this indefinitely. Once you have about 1/2 cup grains, you can start dividing them into 2 batches.